Documents – including shredding/pulping of all paper and cardboard or paper related products. 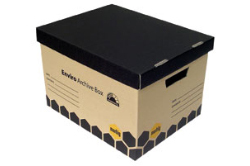 Archive Boxes - whether you have one archive box or ten thousand, we will provide you with a personalised pick up and destruction service. Tapes or plastics - Depending on the types of materials to be destroyed, we process the materials by means of secure crushing or incineration. With up to 25 years in the information destruction field our staff have seen it all, from unbefitting posters of super-models to flawed pharmaceuticals. No matter what materials need to be destroyed, Docu-shred can provide a solution for all of your information destruction needs. We supply workplaces with a choice of both secured and unsecured containers depending on their needs. The most popular of these is our 240lt lockable wheelie bins. These can be provided and serviced on a temporary or permanent adhoc basis or on a scheduled service.